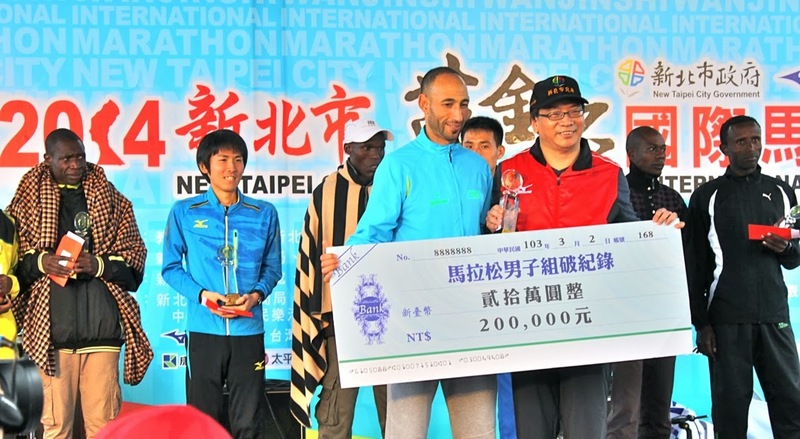 Bringing in a broadly international field of elite athletes from nine countries in a bid for recognition as an IAAF bronze label race, the Mar. 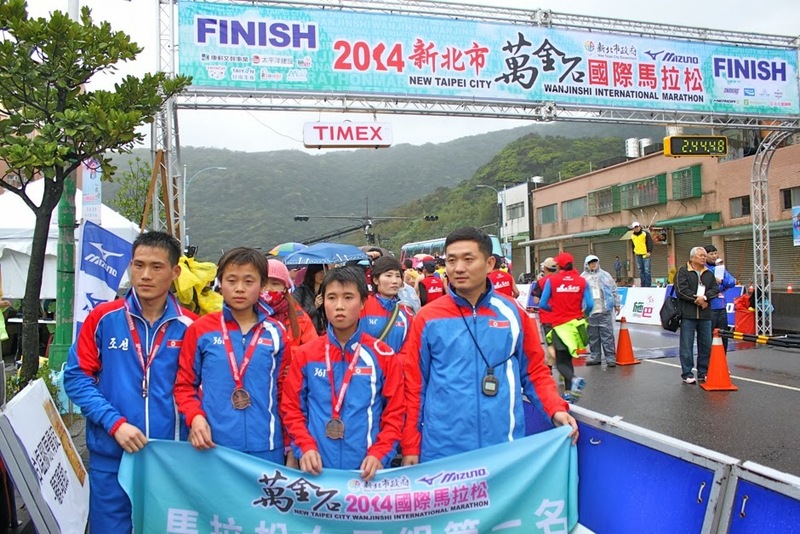 2 New Taipei City Wanjinshi International Marathon was rewarded with new course records in both the men's and women's races despite unforgiving weather. With strong headwinds and rain in the first half of the seaside out-and-back course, the men's lead pack went through a leisurely first half just over 1:11 before rounding the turnaround point and turning it on to take advantage of the tailwind. The men with the two fastest PBs in the field, Gudisa Shentema (Ethiopia) and Hassane Ahouchar (Morocco), burned off Kenyans Wilson Kibet and Geoffrey Birgen and North Korea's Yong Ho Ri to make it a duel. Shentema led by a stride on the final uphill to the finish but Ahouchar's kick proved too strong as he took the win in 2:17:17, almost two minutes better than the old record set last year. Shentema was a second behind him, with Kibet dropping Ri in the final two kilometers to take 3rd in 2:19:11, two seconds under last year's course record. Ri, Rim, Kim and coaches. The women's race was more aggressive, with Australia's Jane Fardell leading North Koreans Ji Hyang Kim and Kum Hui Rim and Kenyan Ednah Mukwanah through halfway on low 2:34 pace. Japanese hopeful Yuri Yoshizumi (Osaka T&F Assoc.) was knocked out of contention early when she slipped on the wet pavement and fell hard in the first 10 km, injuring both legs and arms. Kim kept up the pace after the turnaround, pushing on alone to win in a PB of 2:34:52, three and a half minutes under last year's women's course record. Mukwanah shook free of Rim for second in 2:36:40, with Rim coming through 14 seconds back in 2:36:54, also a PB. Running much of the race alone, Japan's Shoko Shimizu (Team Aichi Denki) took 4th, tying the old course record in 2:38:18. A familiar face further back was 2006 Asian Games silver medalist Kiyoko Shimahara (Second Wind AC), 8th in 2:46:59 in a training run-level effort as she continues her comeback from giving birth to a son a year and a half ago.